Sea, Sand & Sky: Fishing for Bergall- Yum! 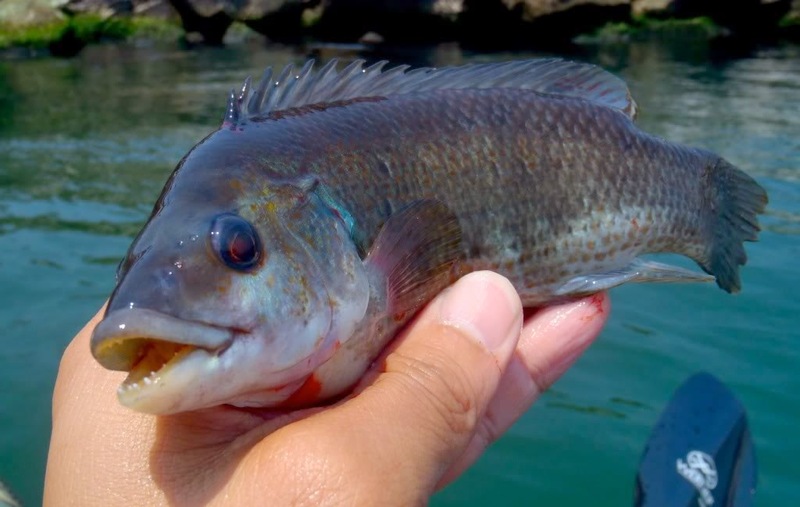 One of our favorite fish to catch here at Save the Harbor/ Save the Bay is Bergall- a small, bony fish often found hanging around the piers we like to fish off of! You may also know them as Cunner or Chogee. While most fishermen consider this fish to be a nuisance, we just love ‘em! Bergall are very sneaky, and love to steal bait meant for larger fish off of fishing lines. However, we like them because they are fairly easy for our youngsters to catch- they are small and abundant in the Boston Harbor -also, they are quite tasty! 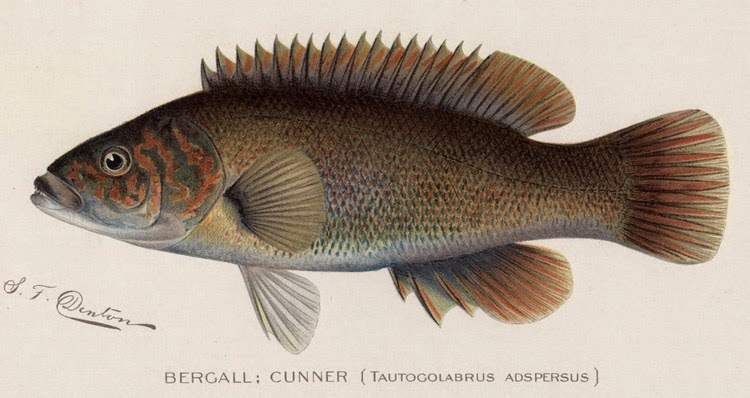 Bergall is a bony fish in the Wrasse family found in the Western Atlantic Ocean along the eastern coast of North America from the Gulf of St. Lawrence down to the Chesapeake Bay. Bergall inhabit shallow, inshore waters and live on or close to the sea floor. They are most often found congregating around piers, wharfs, and wrecks. During the winter months they hibernate in the mud, lying still among rocks or eelgrass beds in a motionless state. Bergall are omnivores and scavengers- they feed on crabs, shrimp, small fish, barnacles, mollusks and even eelgrass. 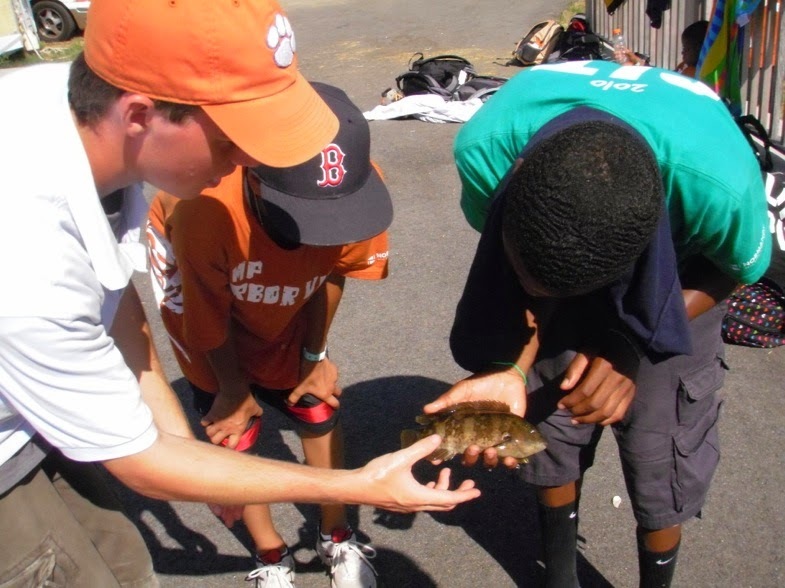 Last years campers holding a Bergall at Camp Harbor View! An interesting fact about the Bergall is that they are able to change color to match their surroundings- this helps them blend in to avoid predators. An easy way to identify a Bergall is to look at their dorsal fin- the fin on top of its body. Their dorsal fin runs all the way down the length of their back, and is spiked towards the front, then turns into softer rays in the rear. They also have iridescent blue streaks running from their mouth to their gill cover. As I said earlier, Bergall are very tasty- they are often overlooked since they tend to be small, but if you catch one big enough to get a nice filet off of- you’re in business! 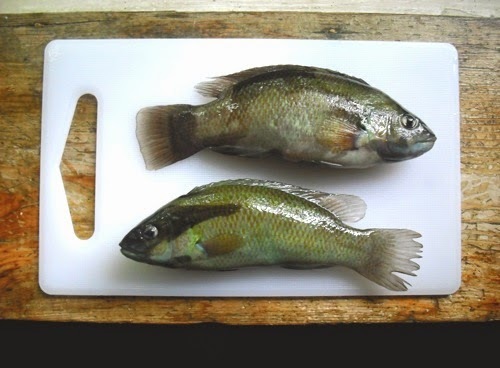 Many people compare the taste of Bergall to Blackfish, or Tautog, and describe the taste to be very complex and a bit sweet. The easiest way to prepare a Bergall is to first filet it, then skin the filet and cut out the remaining bones. Many fishermen suggest skinning it instead of scraping the scales off because they can be very slippery. One great way to prepare Bergall is to make ceviche by soaking cubed pieces of the filet in a lemon or lime juice- the acid will essentially cook the meat and add a great tangy taste to your fish! Another yummy recipe is to bread the filet in a panko crust and simply bake it- and for our adult readers, use your favorite beer batter recipe to coat the filet and fry it up! If anyone catches a Bergall and cooks it up- we would love to hear how it went! Simply post your recipe in the comments section below! Also, check out this youtube video to learn how to filet and skin a fish!